Limited access to finance is still a major concern for many European SMEs, and tighter regulatory capital requirements, as well as the accumulation of non-performing loans, have strongly reduced banks’ capacity to extend new lending. This Q&A section discusses which measures are effective in improving banks’ risk taking capacity and in providing SMEs with alternative financial instrument. Also, this section provides a useful insight into the EIB Group (EIB and EIF) activities in supporting SMEs access to finance. What is special about SMEs financing? Small and medium-sized enterprises (SMEs) are commonly known as the backbone of the European economy. In the European Union (EU)’s non-financial sector, more than 21.6m of SMEs accounted for 99.8% of all non-financial enterprises, employed 88.8m people (66.9% of total employment) and generated EUR 3.7tn in value added (58.1% of total value added), (European Commission, 2014). SMEs have been severely affected by the economic crisis; they face weak demand and heightened uncertainty at a time when the lending and risk-taking capacity of banks, their main source of external finance, has deteriorated. In fact, access to finance and the cost of finance are generally serious concerns for SMEs, more so than for larger enterprises – this is not only a result of the current crisis, but also reflects general market failures. The real creditworthiness of an SME may often be underestimated because of, for example, an “information gap” between lender and borrower. Despite improvements, according to the latest ECB survey (SAFE, ECB 2015a), access to finance remained the most pressing problem for a significant fraction of SMEs (11%). Moreover, large national disparities persist, with access to finance reported to be a pressing problem in countries such as Greece, Ireland, Italy, the Netherlands, Portugal and Spain. Tighter regulatory capital requirements and the accumulation of non-performing loans have strongly reduced banks’ capacity to extend new lending. Is the issue of non-performing loans crucial in Europe today? Will European banks be able to face the challenge without public support or some forms of public/private coordinated actions? Would it be possible to promote the creation of a European market for non-performing loans? Banks need to improve their risk-taking capacity and their room for new lending, by increasing their ability to resolve or dispose of non-performing loans. To do this, a range of complementary efforts are needed that include addressing deficiencies in national regulations and institutions, enhanced technical expertise to deal with asset quality issues, and the development of effective markets for non-performing loans (NPLs). As a consequence of the financial crisis and prolonged economic weaknesses, the euro-area banking sector has been heavily suffering from high levels of impaired assets. The ECB’s calculations show that the level of non-performing exposure (a standardized risk-weighted measure of impaired on- and off-balance exposure) was above 10.5 per cent of total banking exposure at the end of 2014. Write-off rates remain low by international standards, and are less than a quarter of that in the United States. Limited capital buffers and low profitability constrain banks’ capacity to clean up their balance sheets. Legislative bottlenecks and accounting rules may further delay timely loss recognition. Also the lack of a well-functioning market for distressed assets, and costly enforcement and foreclosure procedures, complicate the disposal of impaired assets. Currently, credit growth remains particularly slow in countries where banks report a high level of NPLs, insolvency procedures are weak, and the effectiveness of enforcement is low. NPL resolution would allow the debt of viable firms to be restructured (including needed equity injections), while hastening the winding-down of unviable firms. This would permit capital to be allocated to the most productive investments, providing a further spur to growth. It has been widely argued that high NPLs undermine the capacity of banks to support the economic recovery (see for instance Kashyap et al. (1994)) as they adversely affect banks’ capital positions and substantially raise their funding costs, thereby resulting in higher lending rates and lower credit growth. In addition, persistent high NPL levels have an effect on an unresolved corporate sector debt overhang, which depresses the demand for investment. In the absence of debt restructuring, over-indebted companies have little incentive to invest because any return is used to service their current stock of debt. Based on firm-level data for 2000-2011 in the euro area periphery, Goretti and Souto (2013) investigate the macroeconomic implications of high corporate debt. Their results point to a substantial negative effect of the debt overhang on firm investment. The decision on how to tackle NPLs is critical, as it implies redistribution of wealth. Legal and regulatory incentives to persuade banks to deal with the NPLs issue are crucial. At the same time, a number of different approaches have been used in the EU for targeted NPL resolution, ranging from measures which leave impaired assets on bank balance sheets (managed by an internal bad bank) to the creation of publicly owned asset management companies. Some countries, for example the UK, have used a combination of these approaches. Going forward, the room for direct policy intervention seems to rely more on generating the right incentives and align initiatives. Developing a well-functioning market for distressed debt in Europe could do much to reduce banks’ exposure to NPLs. From 2010 to 2013 European NPL sales increased from EUR 11bn to over EUR 60bn, but trade-volumes still amount to only a small fraction of NPL assets. Additionally, the transactions are still dominated by few markets, including the UK, Ireland and Spain. Many international organisations have recognized the NPL problem. The IMF has taken a number of steps within the Article IV Consultation framework to highlight some of the regulatory bottlenecks in Cyprus, Italy and Slovenia. It has also presented a holistic approach to resolve the problem in the form of consultation documents and round-table debates (see for instance IMF, 2015b, EIB 2014b). The ECB is also monitoring the recent NPL developments in the euro area, enhancing a debate on the most efficient resolution mechanisms. The Vienna Initiative has intensified NPL resolution actions in a number of CESEE countries, including Hungary, Slovenia and the Balkan states (EIB, 2014a). More can be done and realignment of actors and interests is crucial. Are there other ways to improve banks risk taking capacity and allow a diversification of risk out of the banking sector? Bank financing can also be revitalised through instruments that enhance banks’ ability to lend – in particular through securitisation and loan guarantees. SME securitisation – a topic we can only brief touch here – effectively creates a secondary market for SME loans, enhancing the ability of banks to lend to SMEs. European SME-loan-backed securities have performed well, despite the crisis, but this instrument remains severely underutilised. Various initiatives, including those by the EIB Group, aim to remove current hurdles and catalyse the revival of high quality SME securitisation. A more positive stance on securitisation by regulators and the introduction of the ECB’s Asset Backed Securities purchase programme are promising, but more has to be done to revive this market – in particular a pragmatic definition of high quality securitisation is needed (and this definition should include SME transactions). Credit guarantee schemes (CGS) are another institutional arrangement to enhance banks’ risk-taking capacity through risk sharing. CGSs provide partial guarantees on loans by covering a share of the default risk against a fee, they are provided by national governments, private entities or international financial institutions (EIB, 2014c). CGSs are primarily used to alleviate constraints in access to finance for SMEs. Banks are often reluctant to extend uncollateralised credit to SMEs, even at high interest rates, partly due to the high costs of obtaining information on the real credit quality of small and/or young enterprises. As a result, SMEs may fail to obtain the necessary financing even for viable projects. From a theoretical viewpoint the most commonly cited explanation for this SME financing gap is the asymmetric information that, combined with uncertainty, leads to credit rationing as agency problem. SMEs are more affected by credit rationing than larger companies due to the more pronounced information asymmetry (less information available, higher monitoring costs (relative to the loan amounts)). Moreover, the company age plays a role – by nature, young companies (which are typically small) neither have a long track record nor a credit history – and this increases the issue of asymmetric information for them (Kraemer-Eis, Lang and Gvetadze, 2015). While the use of collateral can be an effective solution for alleviating credit rationing, collateral is not always available, and its use may have some drawbacks – e.g. its use might also increase transaction costs (legal and other administrative procedures). Under such circumstances CGSs can help closing the financing gap by substituting collateral with credit protection provided by an external guarantor. Typically, CGS are based on public support, or depend on it – there are some private sector initiatives, such as guarantees provided by the mutual Confidi schemes in Italy and private insurance group COFACE in France, but even such schemes tend to benefit from public counter-guarantees. The need for public involvement in the establishment and funding of CGSs is justified by market failures based on the above mentioned issues (asymmetric information, uncertainty, agency problems), and is intensified by coordination failures among private-sector entities that, under certain circumstances, prevent them from pooling resources. When lenders are risk averse, efficient private sector provision of guarantees may not occur due to collective action problems, i.e. although the stakeholders are aware of the problem, no one does anything about it, as the private interests do not coincide with those of society. The state can be able to resolve the collective action problem that gets in the way of risk spreading. During a downturn banks’ capital and liquidity positions are generally weakened, leading to reduced availability of credit across the economy. At the same time, heightened uncertainty increases the adverse selection and moral hazard problems embedded in SME lending. Borrowers’ default probabilities increase and in parallel, collateral values decrease. All these factors contribute to increasing the financing gap for SMEs, resulting in the potential for economic welfare enhancements through public sector intervention in the form of guarantees. To fulfil their policy objectives, CGSs must be adequately priced and structured, and ideally the risk reduction they provide should be adequately reflected in regulatory capital relief – and in an integrated banking market such regulatory treatment should be homogeneous. Low cost guarantees give rise to moral hazard, undermining lenders’ incentives to monitor and select projects efficiently. A well designed CGS should ensure that risk is shared with the private sector. The use of credit guarantees has been increased during the crisis in many countries. According to AECM, in terms of total volumes Italy, France, Germany and Spain are the largest guarantee markets in the EU. Collectively these four countries account for around three-fourth of total outstanding amounts. Relative to GDP the highest volume of guarantees is currently provided in Italy (2.1%) followed by Portugal (1.7%), Hungary (1.3%) and Romania (1.1%). Information asymmetries, risk taking, risk diversification. How to induce arm’s length investors to buy SMEs equity and debt? Part of the solution to banks limited risk taking capacity is to develop more diversified sources of finance and alternatives to loan financing, accessible for Europe’s SMEs. This calls for further development of existing instruments like Europe’s markets for external equity. These financing forms are not to be seen as a substitute for traditional, mainly bank-centred, SME financing instruments. Rather, they serve a specific and small group of SMEs, which is, however, very relevant for the innovativeness and growth of the overall economy. This is particularly true for venture capital (VC), which is a sub-segment of private equity (PE) that is typically provided to new or young enterprises with high innovation and growth potential. Compared to the well-developed US market, where VC investments represented 0.3% of GDP in 2014, European venture capital is still lagging behind (EUR 4.1bn in 2014). The recent crisis has even increased the gap between the two geographies, as the share of VC investments in relation to GDP shrunk from 0.05% in 2008 to 0.02% in 2014 in Europe. Although European VC has somewhat recuperated from the crisis, the recovery in VC investments, fundraising and exit markets (all well below pre-crisis levels) has by far not been that strong than what has been observed for the overall private equity market over the last years, which was, however, to a large extent driven by buyout deals for larger companies. Government agencies accounted for 35% of total VC fundraising in 2014 (data from EVCA), which shows a continued counter-cyclical support and helped to stabilise the markets in the current crisis. In addition to equity-type financing solutions, emerging alternative financing sources like non-bank lending, minibonds, private placements, marketplace lending, or microfinance solutions (the latter with a stronger focus on “social lending”) can help improving SMEs’ access to finance. Minibond markets, for example, are emerging in several countries – but most of the transactions are related to mid-sized companies rather than “real” SMEs. One example is the Italian mini-bond market that is developing since 2012 after the introduction of the “minibond law”. Another example is the German market, however, in this case with a mixed experience – due to a series of defaults. The increasing number of debt funds and initiatives in the area of institutional non-bank lending are as well market-driven responses to fill bank financing gaps and to diversify financing possibilities of SMEs as complementary approaches to traditional bank loans. Many of these initiatives are as well “co-productions”, i.e. cooperation between the banking sector and alternative financing sources, e.g. insurers (see for more details: Kraemer-Eis, 2014). Better developed capital markets across Europe would help improve the resilience and efficiency of Europe’s financing structures in the longer term and the European Commission’s (EC) proposal for a Capital Markets Union are going in the right direction. But we also need a strong, efficient and resilient banking sector in Europe – also after the crisis banks will remain the main provider of external financing for SMEs. The implementation of the Banking Union is a big step forward, with a process of clean-up and recapitalisation already taking place to a large extent. What is the EIB Group doing to support SMEs access to finance? The European Investment Bank (EIB) is the European Union’s bank; it is the only bank owned by and representing the interests of the European Union Member States. The EIB Group consists of the EIB and the European Investment Fund (EIF) – the specialist arm providing SME risk finance (incl. guarantees and securitisations). The EIB is the majority EIF shareholder with the remaining equity held by the European Union (represented by the European Commission) and other European private and public bodies.1)For more information please refer to www.eib.org and www.eif.org. Supporting SMEs and midcap finance is one of the four public policy goals of the EIB Group and represents the Bank’s single largest policy priority in terms of activity volume (see for details EIB Group, 2015). Access to finance for SMEs can be strengthened through various instruments that either enhance banks’ ability to lend or provide complementary sources of financing. In a continuously challenging macroeconomic environment, in 2014, the EIB Group’s support to SMEs amounted to a record of EUR 28.1bn (new operations signed), of which EUR 24.8bn from EIB and EUR 3.3bn from EIF. With these commitments, the EIB Group estimates leveraging at least EUR 63.6bn of finance for SMEs. Over 290k SMEs employing approx. 3.9m people received support through the EIB Group in 2014. The Group provides an increasingly wide range of predominantly intermediated debt-financing, risk-sharing products (guarantees, securitisation) and private equity/venture capital/growth capital instruments, enabling continued access to finance for SMEs. The Group intensified the collaboration with the EC and launched a new generation of financial instruments in favour of SMEs and midcaps. They include Horizon 2020 InnovFin – EU Finance for Innovators, the EU SME Initiative, 2)InnovFin consists of a series of integrated and complementary financing tools and advisory services offered by the EIB Group, covering the entire value chain of research and innovation with a wide range of equity, debt and guarantees products. Financing is either provided directly or via financial intermediaries. COSME improves access to finance for SMEs through two financial instruments: the Loan Guarantee Facility and the Equity Facility for Growth, both implemented by EIF via financial intermediaries. For more information please refer to the websites, mentioned in the previous footnote. and risk sharing products under Competitiveness of Enterprises and SMEs (COSME), implemented by EIF. Moreover, the Investment Plan for Europe, a joint EC / EIB Group initiative, supports risk finance for SMEs and should unlock investments EUR 75bn for the benefit of Europe’s SMEs and mid-caps. Since the start of the financial and economic crisis in 2008, the EIB Group has responded to Europe’s call to support the troubled economy by increasing its activities significantly – also based on capital increases of EIB and EIF. The EIB Group continuously works to strengthening its support for SMEs and midcaps and heightened cooperation with the EU Member States and public promotional institutions to establish tailor-made innovative financing facilities for SMEs and midcaps to help maximise resources. Furthermore, the Bank’s advisory services complement the finance activities for the benefit of SMEs. As outlined in more detail in Kraemer-Eis, Lang and Gvetadze (2013), efficient markets do not require public intervention. However, as also discussed above, there are market imperfections affecting SME finance that are serious enough to warrant public intervention. This intervention to mitigate the “bottlenecks” must be conditional upon ensuring “additionality,” i.e. not crowding out private activities, but rather serving as a catalyst for the entry of private capital in order to create self-sustainable markets in the long run (Pelly and Kraemer-Eis, 2011). Public support must improve the conditions for entrepreneurship and the overall business climate for SMEs without distorting efficient market forces. Given the diversity of the European SME population (i.e. in terms of size, sectors, age, growth model) – there is as well a diversity concerning external financing needs among this population in terms of instruments (equity, debt, mezzanine), and also with regard to the appropriate financing sources and channels (traditional banks, equity funds, microfinance institutions, guarantee schemes, non-bank-lending sources etc.). Consequently there is no “catch-all” policy instrument to support SMEs; instead, a toolbox of targeted instruments has to be applied. We also claim that this toolbox must be continuously reviewed and possibly adjusted, depending on markets’ needs (Kraemer-Eis, Lang, and Gvetadze). Consequently, the range of EIB Group instruments develops over time and the different EIB and EIF instruments are designed to play complementary roles. These instruments can have the objective to mitigate permanent market weaknesses in traditional financing channels, others are designed to develop or kick-start alternative ways of financing. Moreover, products and product-combinations can (and have to) change over time – for example, to enhance lending to SMEs, the provision of long term funding by EIB for banks was key in particular at the peak of the crisis – later-on more and more demand for risk sharing or joint products emerged, as combination of long-term liquidity provided by the EIB and risk sharing via the EIF and its long-standing market experience in providing guarantees for SME portfolios. 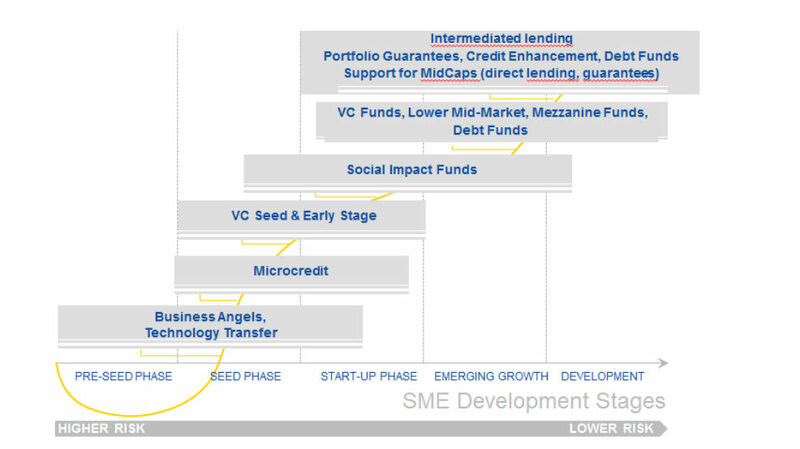 The classic lifecycle graph below outlines indicatively the existing areas of intervention by the EIB Group in the financing of SMEs. More ‘traditional’ instruments are in particular intermediated loans (EIB) as well as guarantee- (EIF) and securitisation- (EIF & EIB) solutions to mitigate credit rationing in bank lending (and covering a high number of small businesses). On the equity side there were – and are – Venture Capital solutions in order to support the development of the comparatively young European VC market (and covering a rather small number of highly innovative companies). Over time, additional instruments have been added, like technology transfer (to support the commercialisation of Universities’ research know how) and Lower Mid-Market activities, as well as mezzanine instruments in order to meet increasing market needs in between debt and equity instruments, in particular for companies in special situations (like strong growth phases). Newer instruments by are, for example, the support of microfinance (in Europe) as a reaction to the social crisis (resulting from the economic crisis). Moreover, social entrepreneurship is facilitated via Social Impact Funds activities. Another example is the support of Business Angels – to complement support measures in the VC space and as a reaction to mitigate weaknesses in the Venture Capital market and to incentivise alternative investors)., Furthermore, portfolio guarantees to the benefit of innovative SMEs have been successfully introduced to foster innovation. Another recent development is the support of debt funds – in order to encourage the development of alternative financing sources (alternative lending, minibonds). Other recent examples are targeted intermediated loans and tailor made initiatives supporting SMEs’ internationalisation, or pilot projects in the field of peer-to peer lending. Figure 1: The EIB Group’s product range for financing small businesses 3)On purpose, debt funds are mentioned twice as they can either have a form that is closer to securitisation transactions (based on diversified portfolios, but not tranched), or a form that is closer to private equity (based on non granular portfolios). It is well-recognised that governments and public institutions play a very important role in creating a better environment for financing business, but in this context it is important to mention that, it is just as important to realise that public support alone cannot be the only solution – it needs to play a catalytic role to attract private financing and to crowd-in private investors (Kraemer-Eis, Lang, Gvetadze, 2013). OECD, 2011. Financing high-growth firms. The role of angel investors. December 2011. 1. ↑ For more information please refer to www.eib.org and www.eif.org. 2. ↑ InnovFin consists of a series of integrated and complementary financing tools and advisory services offered by the EIB Group, covering the entire value chain of research and innovation with a wide range of equity, debt and guarantees products. Financing is either provided directly or via financial intermediaries. COSME improves access to finance for SMEs through two financial instruments: the Loan Guarantee Facility and the Equity Facility for Growth, both implemented by EIF via financial intermediaries. For more information please refer to the websites, mentioned in the previous footnote. 3. ↑ On purpose, debt funds are mentioned twice as they can either have a form that is closer to securitisation transactions (based on diversified portfolios, but not tranched), or a form that is closer to private equity (based on non granular portfolios).